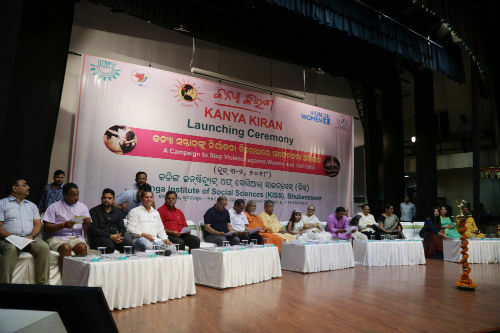 Bhubaneswar: Kanya Kiran, a Campaign to Stop Violence against Women and Girl Child was launched by KISS in association with UN Women and Kalinga Fellowship on Sunday. Prafulla Samal, Minister of Women & Child Development (Mission Shakti), and MSME, Odisha; Dr. Prasanna Kumar Patasani, MP; Ananta Narayan Jena, Mayor, Bhubaneswar; Priyadarshi Mishra MLA, Bhubaneswar (North); Sandhyabati Pradhan, Chairperson, Odisha State Commission for Protection of Child Rights; Y. B. Khurania, Commissioner of Police, Bhubaneswar-Cuttack; Madhusudan Das, NYP, Odisha; Social Activist Subhashree Das and Dr. K. Abdul Ghani, Dillip Hali, eminent journalist and Mrigakshi R. Kumar, little Miss World Galaxy awardee flagged off the campaign and addressed the gathering. Despite stringent laws, the violence on women and girl child are increasing day by day, the dignitaries said. Unless mindsets of people change, we can’t overcome this problem. Awareness among the masses is the need of the hour. We all should come forward and fight against such evil activities. KISS has taken a praiseworthy initiative by starting a campaign in the name of Kanya Kiran to stop violence against women and girl child, they added. In his welcome address Dr. Achyuta Samanta, Founder, KIIT & KISS said, for last five years, during the summer break, the students of KISS and their parents engage themselves in awareness programmes on important social issues. This year 27,000 students of KISS along with their parents and 3,000 women staff of KIIT & KISS will be campaigning on the theme “Kanya Kiran” to Stop Violence against Women and Children. Among others, Smt. Saswati Bal, President, KIIT & KISS; R. N. Dash, Secretary, Dr. Harekrishna Satapathy, VC, KISS-DU; Dr. Sasmita Samanta, Registrar, KIIT-DU; Dr. Prashanta Kumar Routray, CEO, KISS; Himansu Khatua, CMD, Kalinga TV were also present. 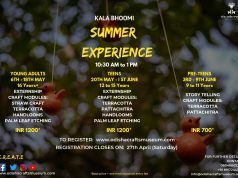 Also the representatives and volunteers of SOCH, SOPVA, We For You, Susampark, Youth For Seva, Parichaya, Udayama Charitable Trust, Winners’ Associtation, Janani, Sakha, Bakul Foundation, WISH, Unplugged Dreams, Satyanagar Ladies Forum, ISD, Smruti Seva Sanjog, AASHAYEIN, People For Seva and Ray of Hopes joined the launching ceremony.